While visiting a Japanese Maigret site recently, Paris du Commissaire Maigret, I noticed a page investigating Maigret's sister-in-law, Hortense. Hortense? Was Mme M's sister named Hortense? There was the reference, right at the end of Chapter 6 of Maigret Takes a Room [Maigret en meublé] (MEU). Mme M had been called to Alsace two days before, to take care of her sister, who was to have an operation. Now she called with her plans: "Listen. Hortense is much better and I might possibly get home in two days..."
I knew David Drake's opinion, for he'd written in a draft edition of his Maigret Biography that "the Maigrets only had one close relative, Louise's sister, Elise Leonard Lauer. She and her husband, Charles Lauer, regularly visit the Maigrets in Paris, and Louise, sometimes with Jules, annually visited the Lauers in Alsace." Elise Leonard Lauer. Since nowhere in the Maigret Chronicles is Mme M's sister referred to by her full name like that, let's see how Dave must have worked it out. The Leonard is easy. Maigret's Memoirs tell us how M met Louise Leonard, who was to become his wife, and although there's no mention of a sister in that volume, it follows that her sister's maiden name would also be Leonard. How about Lauer? "Philippe Lauer was a great, plump, red-haired lad with a pink complexion; shortsighted, with glasses. He was Mme M's sister's son, born down in Alsace, and M had got him into the Quai des Orfèvres... Émile Lauer, Philippe's father, was short-sighted, like Philippe. He'd said it was M's fault Philippe had joined the police, instead of looking for a good job in a bank." Now, in L'Ombre chinoise, [Maigret Mystified] (OMB), we again learn M's brother-in-law's name and occupation... but this time it's André, and he's "a worthy fellow who ran a brickfield." To summarize, looking through these Fayard Maigrets, we find no mention of Mme M's sister's name, consistent mention that the family lives in Alsace, and two different husbands, Émile and André, presumably following two different occupations, as it seems unlikely for a brickyard owner to downplay his son's joining the police "instead of looking for a good job in a bank." And we know that at least one of the sister's children was Philippe. About the only other mention of Mme M's family was in The Flemish Shop (1932) (FLA), where "Anna Peeters had brought a letter to the Police Judiciaire, which M had recognized from the writing as being from Mme M's cousin in Nancy." Continuing with the "chronological by year of writing" approach, we enter the dry period of Maigret novels, and come to the first set of short stories, which are consistently inconsistent with regard to M's life. In "Madame Maigret's Admirer (amo)," it seems that her sister lives in Paris, for we read that "Mme M had visited her sister that afternoon, and the next day she'd seen the stranger again, at the same time...."
There's some more on her family in "The Unlikely Monsieur Owen" (owe)  "Aunt Émilie (Mme M had eleven aunts!) being taken seriously ill in Quimper." And then we get a serious departure from dependable Alsace connection in "The Man in the Street" (hom): "Mme M was disappointed, because her sister had come for a visit from Orléans, and she had prepared a special dinner, but M rushed out again." There was a message on his desk from Mme M: Élise has arrived from Épinal with her husband and the children. I've asked them all to stay to dinner. They've brought some cèpes.... M thought of Mme M, who at that moment was entertaining her sister and brother-in-law, the cèpes simmering on the stove, exuding an appetizing smell of garlic and damp woodland. He adored cèpes. Yes, there's Élise, but what's she doing in Épinal? 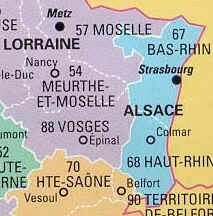 Pretty close to Alsace, but still... have they moved? The inlaws visit again in Maigret's Pipe (PIP), but no new information appears outside of the brother-in-law's smoking habits: "M kissed his sister-in-law, who had put on weight again... Liqueurs were being handed round. The two women were talking cookery. The brother-in-law was listening vaguely as he smoked a cigar..."
Mme M, who was entertaining her sister to dinner, rang at 6 to make sure M wouldn't be late and to remind him to stop at the cake shop.... There was also the niece of his wife's, whose name was Aline, and whom everyone called Nine.... M kissed his sister-in-law, who always smelt of lavender. They had dinner. He drank a glass of Calvados. Before seeing Odette to the métro he called up Police Headquarters...."
Which brings us back to where this started, with Maigret Takes a Room (MEU): "She had been called away to Alsace, to the bedside of her sister, who was going to have an operation.... 'Hortense is much better and I might possibly get home in two days.'" Ah yes, Mme Maigret's sister, Élise Odette Hortense Leonard Lauer... but where is Charles? Mme M's sister lived in Colmar with her husband and children, owned a chalet on the Col de la Schlucht, where the Maigrets had been fairly often, and where life was pleasant and restful.... Charles, M's brother-in-law, had just bought a new car, and decided to take the family on a trip to Italy. Mme M's sister lived in Mulhouse with her husband, a civil engineer [Bridges and Highways]. They been to visit her often.... Mme M called her sister in Mulhouse: "Is that you, Florence... Do you by any chance remember somebody named Keller?" No, of course not! Just Georges pulling our collective leg once more.